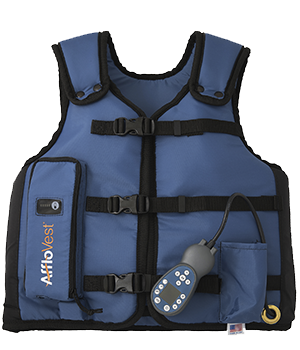 The AffloVest is the first battery operated High Frequency Chest Wall Oscillation (HFCWO) airway clearance therapy that was scientifically engineered to closely mimic manual CPT, the gold standard in airway clearance therapy. Patented Direct Dynamic Oscillation™ technology can help loosen and mobilize secretions. With no bulky hoses or generators, the AffloVest is engineered to encourage compliance by allowing patients to experience an improved quality of life with full mobility during treatment. The AffloVest has eight oscillating motors creating eight individual pressure wave forms that closely mimic manual CPT, providing disruption in the lungs and mobilizing secretions, helping the body’s task of discharging harmful excess secretions. These individual motors allow AffloVest to target different areas of the lungs.